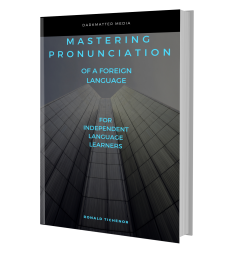 Get My Ebook Mastering Pronunciation of a Foreign Language! I sound awesome in my head! One of the hardest things to do when learning a language is to speak. We spend so much time and effort learning so much grammar, endless vocabulary words, and perplexing idioms. We're taught how it is supposed to sound in the beginning, but the vast majority of our focus is on all that other stuff. When it's time to start speaking we find that we've just barely begun to work on our accent. It's disconcerting. There is so much to learn that perfecting our pronunciation becomes an afterthought. Literally. Years ago I came across a guy who was boasting to people about just coming back from his very important trip to Germany, where, of course, he spoke German fluently. As it turned out, he didn't speak German well at all. In fact, he could barely mutter a few words. But he insisted that he knew German very well, and then he said it - "I sound awesome in my head!" Immediately after he said it he burst out laughing at the absurdity of it. We all did. As a language learner, we all need to feel confidant but this was going too far and he knew it. Claiming to have learned a language and to speak it fluently because you sound awesome in your own head, when you can only blunder out a few awkward words, isn't reality. But it struck a chord with me - I knew what he meant. As a perfectionist myself, I want everything to be perfect. I want to know exactly how to say everything, in an eloquent and flawless way, and sound like a native speaker. But that's hard to achieve. You can study a language, for years even, and know lots about it, but still not be able to speak it. It's not only possible for this to happen, it's typical. The problem with sounding awesome in your head is that it doesn't help you all that much toward actually speaking the language. I might argue that it's the first step in knowing exactly what you are supposed to sound like. But it's not the finish line. There is a huge amount of work that must follow. Isn't it kind of obvious that learning to speak a language might require you to actually speak aloud? A lot? Waiting until after you've studied all that grammar and vocabulary just seems like you have so much more to do just when you thought you were reaching your goal. What if there was a way to study, improve, even master your pronunciation as you worked through all that vocabulary and grammar? Even better, what if you could do it from the very beginning? Practicing speaking aloud in a language you were just beginning to learn? In my ebook Mastering Pronunciation of a Foreign Language : For Independent Language Learners, I look at this problem of learning spoken language a little differently than they do in most published courses. And I try to solve it in two specific ways. One is that I break down spoken language into two fundamental features that you need to identify and begin to use in order to pronounce it correctly and speak with a good accent. Every language course introduces you to the first of those fundamental features, but they don't really follow up on it as they should. And the second? They hardly ever even mention it! It's not necessary to understand this feature in order speak a language at a basic level, but it's absolutely essential to develop a really good accent. Understanding this can give you the key to improving pronunciation to master-level. The other way I approach learning spoken language is that I view learning to speak as actual physical training. When you learn a new language, you must use your mouth, lips, tongue, cheeks, heck even your breathing differently in order to speak properly. You can't simply be introduced to a few new sounds of a language and then speak it like a native. It just doesn't work that way. There are tons of subtle differences in many of the sounds you must make when learning a language. And putting it all together to try to sound good requires a lot of focused effort. Most courses will tell you that, but won't give you a real path to do it. In my ebook, I outline a three-step process that does just that. I show how to use two simple techniques that allow you to work toward an outstanding accent that will impress the natives and stun other learners. Disclaimer - I said simple because these techniques are simple to understand. But they're not easy. They require a lot of work. But if you've read this far, I know you're the kind of serious language learner that can benefit from this! Anyone can learn how to do these techniques and you can use them throughout your study of a language and beyond. And if you've already studied a language before and just want to fix your flawed accent? The beauty in this process is that it can be used alongside any other course that you're studying from. In fact, it isn't even a course so much as a complementary process of techniques that anyone can use with just about any language at any point in their learning process. The upshot is that if you understand these basic principles, and use these techniques, you can can develop your pronunciation more efficiently and faster than the typical approach. It won't cost more than a few extra dollars at most and you can even do this right from the beginning of studying a language. In fact, you will have even better results if you do this from the beginning! It makes the entire language learning journey a better and more successful one. You can propel your pronunciation to master-level for free! Download Mastering Pronunciation of a Foreign Language : For Independent Language Learners in a PDF format, Epub or Mobi for Kindle at Smashwords right now! Or look for it at your favorite ebook retailers such as Barnes and Noble or Apple iBooks!